The Ring Presenter is a clever wireless, multi-function, five button mouse and laser pointer, all packaged into a small, light-weight, soft natural rubber finger ring. Powered by a thin, built-in Lithium-ion rechargeable battery, the 2.4 GHz wireless mouse has an operating range of more than thirty feet. There is even a built-in blue LED that flashes when the battery needs to be recharged. A three position slide switch on the side of the mouse controls the modes and power on/off. The device is available in seven colors. 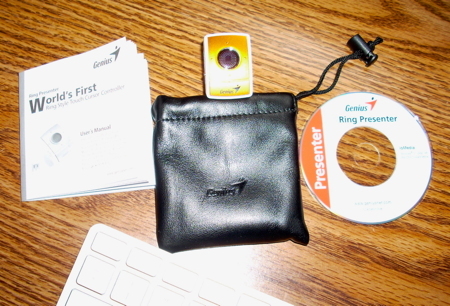 The Ring Presenter comes with a mini CD driver, multi-language user manual, and a carrying pouch as shown in Figure 1. A Micro USB Charging cable and a Pico USB receiver are also provided. I installed the driver on my iMac using an external CD drive that could handle the mini-CD. The slot drive on the Mac does not support the mini CD and will get jammed in the slot. You can also go to their web site and download the driver directly. Driver installation was simple and after a restart of my iMac, I was ready to charge the ring and test the wireless connection. 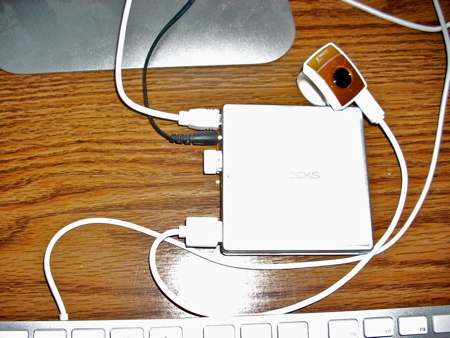 I then connected the USB Pico receiver, and the Micro USB charging cable with the Ring Presenter attached, through my powered i-rocks Hub Reader device as shown in figure 2. 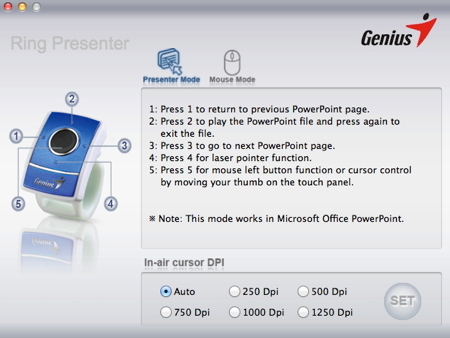 The Presenter Mode provides controls that work in Microsoft Office PowerPoint. I tried the Presenter Mode with Apple’s Keynote and found these buttons work the same with the exception of pressing 2 does not start the play function but it does exit the Keynote file. 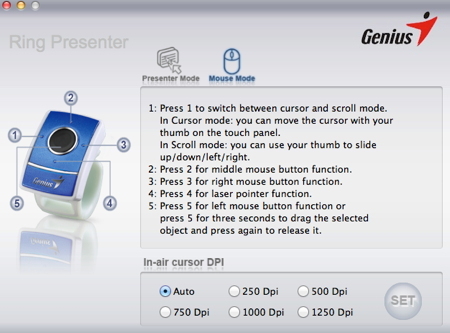 You can also set the cursor speed by using the In-air cursor DPI setting in this program. I found the Auto setting cursor movement was a little quick for me so I prefer the 750 Dpi setting. The red Laser pointer is right at your thumb at the bottom of the ring and projects a bright red dot easily beyond the range of the wireless mouse. The combination of the wireless mouse and Laser pointer makes the Genius Ring Presenter a clever device that would work well in presentations in a business meeting or in the classroom. It provides you with the freedom to move around the room and still have a wireless mouse control of your computer and the presentation right on your finger. In summary, the Ring Presenter is a clever wireless mouse and pointer device that actually has a power switch and an indicator light to let you know when the rechargeable battery is low on charge. However, I think a PDF version of the User Manual would have helped with the small and difficult to read instructions. Also, the supplied mini-CD is a concern for those with a slot drive.